This post is so important to me because I am right in the middle of translating Linear B Tablets with regard to Military Affairs. The 4th century A.D. in Britain is viewed by many as a golden age, and the Cotswolds was the richest and most peaceful area of Roman Britain. 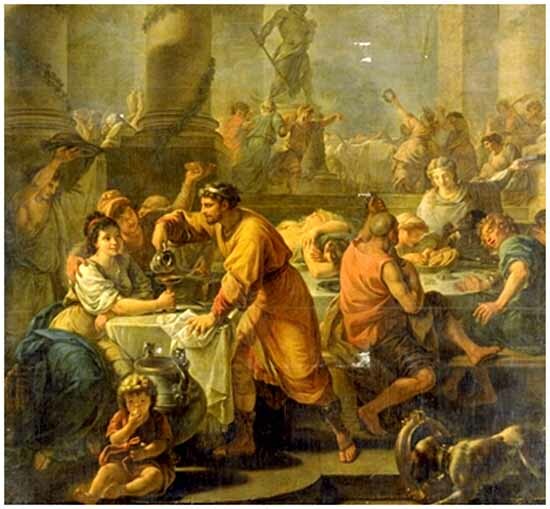 Then, as now , wealth was concentrated in the hands of the few, especially public officials, benefiting from corrupt and wildly inefficient’ economy of the later Roman Empire. 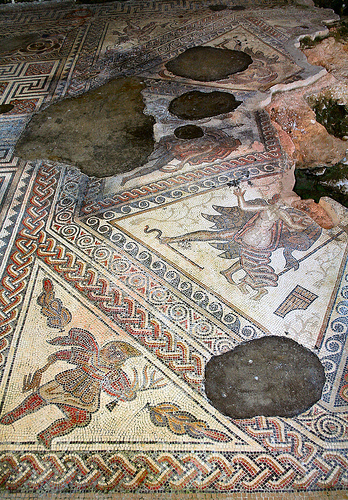 Here in the Cotswolds , England is where the remains of the famouse Chedworth Roman Villa stand. Looking out from the main villa buildings today it is easy to imagine that the view has not changed to much in centuries. Nestling in a combe, at the head of a shallow valley enclosed on all but the eastern side, there is nothing modern or intrusive as far as the eye can see, just woodland,fields, dry-stone walls, hedges and sky. In fact the sense of remoteness and tranquillity is greater now than it has been in the past. If you climb the steep path that leads west from the villa park, you will discover the abandonded track of a railway, built in 1889-1890 with stations at Chedworth and at nearby Withington. Today, the noisy and intrusive line is a peaceful path, where geologists come to study the classic limestone exposures revealed in the sides of the railway cutting. The construction of the line and its widening in 190l-1902, led to the destruction of a Roman structure that once overlooked the villa and combe. This was found at the same time that the main villa was being excavated in 1864. 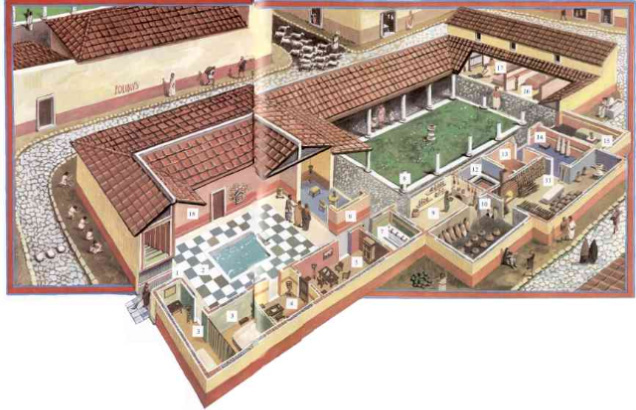 Reconstruction of a Roman Villa with an antrium near the entrance and a compluvian and impluvian to collect and filter rainwater, a tablinum (home office) for receiving guests. Simon Esmonde Cleary says, in his book about the villa, that it’s tempting to think of this building as being a mausoleum; perhaps this was how the villa-owning family asserted and made visible their ancestral ownership of the land and their status within the locality. ;Set high on the ridge above the villa,it was meant to be seen from the surrounding countryside, and a reminder that the 4th century complex sat in open countryside, rather than being surrounded by woodland as it is today. Another building stood about 700 yards east-south-east of the villa, in what is now dense woodland. In plan this is a typical Romano-British temple with an entrance façade of stone columns , looking out over the Coln valley. Column fragments were found when the site was excavated by Farrar in 1864, and again by Claire Baddeley in 1925-1926 , along with a stone relief carved with a figure holding dead hare, flanked by a dog and a stag, now on display at the villa museum. The relief suggests a dedication to Silvanus, originally the Roman god of woodlands and fields, but in Britain regarded as more of a god of hunting. Visitors in the 4th century arrived, probably with their substantial entourage would pass the temple to Silvanus, perhaps stopping to make an offering, then turned up the drive to the villa gatehouse thus passing into the first two courtyards. 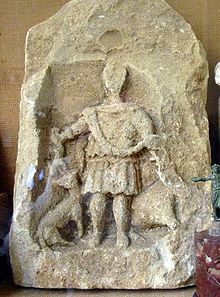 Stone statue of Silvanus with a hound at his feet and a hare in his hand. Bustling with activity, this lower courtyard served as a status symbol, only the important guests passed from here, climbing literally and socially via a ramp or a flight of steps to a second gatehouse, and into the exclusive inner courtyard. No doubt they brought gifts for their host and were greeted formally as they arrived, before being shown to the guest accommodation in the north wing, with its own separate bath suite, where a steaming tub of hot water awaited, and the chance to freshen up after their journey. Some see the villa as a shared home of joint owners, or proprietors, with multiple families or multiple generations living together and reflecting a British social structure. The villa however is more easily interpreted as a main house and guest wing, so designed so that the villa owner could receive visitors, accommodate them and their families and servants, entertain them and impress them with the luxury and good taste reflected in the buildings of the inner courtyard. So who was the host we ask ourselves, and what sort of people did he/she entertain. He could have been a local aristocrat, a descendant of the pre-Roman British elite of the local Dobunni tribe, or he could have been a senior official, responsible to the provincial governor,. 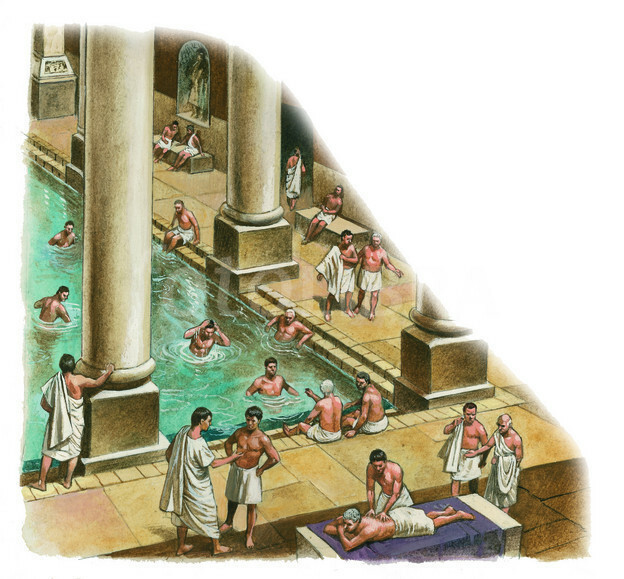 As for the guests, they were likely to be people of many different ranks, and would be treated accordingly, with only the most important indulging in the full set of social rituals such as hunting, bathing and dining- that were employed to cement bonds between people of equal rank or to forge and reaffirm bonds between patron and client. The evidence of hunting was part of the entertainment at Chedworth is very strong. Finds from the site include a large number of spearheads and arrowheads, and legally the only reason why a civilian might carry such weapons is for use in hunting (whether that law was enforced is another matter). As well as the statue and temple to Silvanus, and the two statues of Diana the Huntress came from the villa. More direct evidence is the considerable quantity of antlers recovered from excavations in the lower court’s south wing and the number of wild boar bones recovered from the upper courtyard. Chedworth bath suite provided an opportunity for host and guest to discuss business in confidence followed by the formal dinner, the highlight of which gave the host the opportunity to show off the house and to serve rare foods and wines in ingenious ways. The evidence for Christianity in Britain at this period is not impressive it tends to blind us to the continuity of traditional religions. Probably religious affiliations were switching back, and forth at this time, according to what seemed most expedient. Back at the dinner party, if all failed. the host and guest could always talk about the weather. The corners of the mosaic contain charming and witty depictions of the four seasons, spring is a cherub with a basket and a swallow in his hands, summer basks naked and holds a bunch of flowers, autumn is damaged but apparently holds a basket of fruit, while winter is wrapped in a hooded woolen cloak with firewood in one hand and a hare in the other, no doubt destined for the pot. Part of the four seasons mosaic. 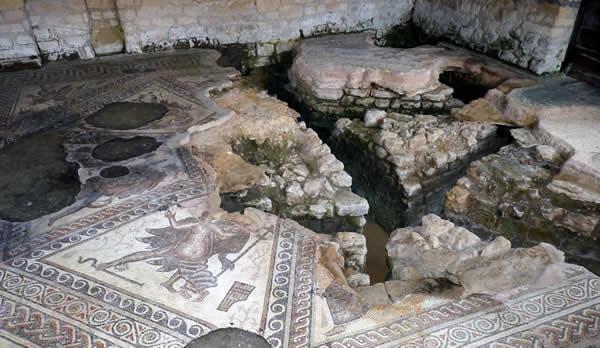 David Neal and Stephen Cosh who are experts on Romano-British mosaics, believe that the mosaics of the imperial palace at Trier were laid by mosaicists who went on to create the internationally renowned Woodchester, pavement. Could Woodchester, emulating Trier have set the standard that the other wealthy landowners of the Cotswolds sought to emulate as a way of proclaiming their status, it seems likely Chedworth Roman villa in its heyday must have been a magnificent place so when one visits to see the archaeological remains we have to use our imagination, which for me, doesn’t take much. Source: Where did the Minoans come from? This post is a follow on from my post in July 2014 entitled The Ancient Minoan Culture (DNA reveals their Origin. Thank you Luciana Cavallaro. for this splendid update. This talk was given by Richard Vallance who is teaching me the Mycenaean Linear B ancient script writings. From this you will see how I am progressing with my studies. As lead curator of the project, I am extremely excited that the exhibition Celts: art and identity at the British Museum is now open. Organised in partnership with National Museums Scotland, this is the first major exhibition to explore the full history of Celtic art and identity – but who were the Celts? 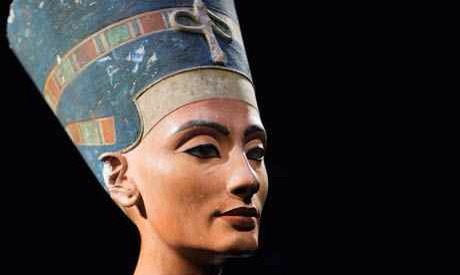 The iconic bust of Nefertiti (Source: Ahram Online). “Reeves announces in a press conference held today that Tutankhamun’s gold funerary mask originally belonged to Queen Nefertiti.